Situated at the ocean side, Seaside Village offers the complete holiday experience. Set in a secure complex, the self catering apartments here enjoy 24 hour gated security along with internal patrols. The sizeable apartment block surrounds a shopping complex that includes various shops, a laundry service, video store and 5 well known restaurants including Alexia's and Col'Cacchio. 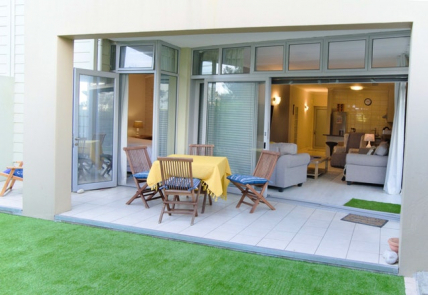 With all of these features, plus the Big Bay beach close by where you can watch surfers, wind and kite surfers, this is the kind of holiday accommodation where you would not have to go anywhere to have a good time. Going further you can enjoy some time out at various other tempting restaurants, a cinema and even make use of a medical facility. Adding even more appeal to this location, 15 to 20 minutes is all that separates you from the picturesque Kirstenbosch Gardens, Canal Walk and the Table Mountain Aerial Cableway to enjoy a magnificent view and sunset at the top of Table Mountain.